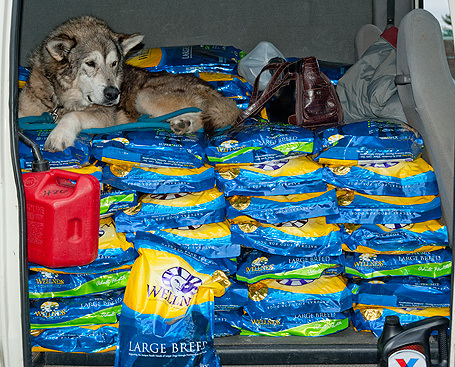 Top: Peg, from Wolfdog Rescue Resources picking up a haul of food for 7 rescues in the Missouri area on October 30, 2009. Top: Geezer, guarding all of the food. We are told he rode the whole way back up there! Top: Maddie & Friends, Inc., October 26, 2009. Top: Jayme from NE Animal Rescue, October 26, 2009. Top: Patty from Little Lions Cat Rescue, October 26, 2009. Top: PA Boxers, Inc., October 21, 2009. 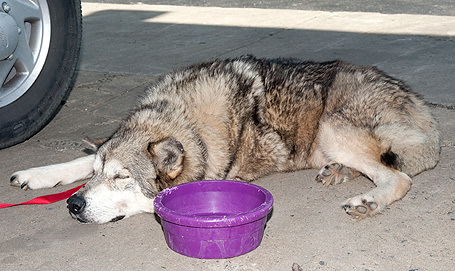 Top: Nancy from Lonely Hearts Animal Rescue, October 20, 2009. 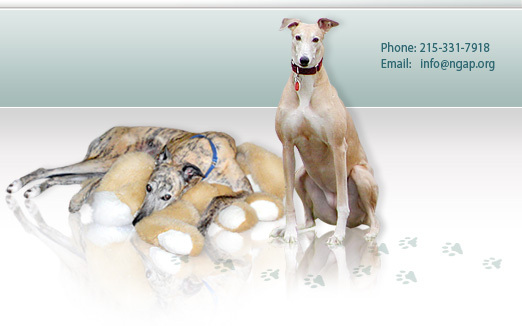 Top: Kim from Wet Nose Rescue, October 20, 2009. Top: Dave and Kathy from MaPaw Siberian Husky Rescue, October 19, 2009. 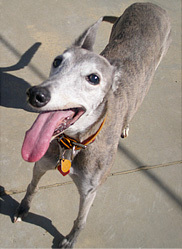 Top: Ed from LaMancha Animal Rescue, October 19, 2009. Top: Courtney & Margaret from Cats Bridge to Rescue, October 12, 2009. Top: Carolyn from Almost Home Dog Rescue picked up a load Wellness dog food and assorted treats and supplies on October 9, 2009. 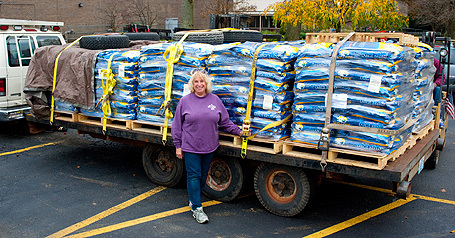 Top: A volunteer from Furry Friends picks up a truckload of dog food and treats on October 8, 2009. 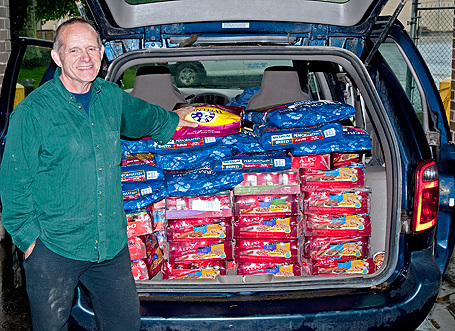 Top: Gary from Hillside SPCA picks up a load of cat food and dog treats on October 8, 2009. 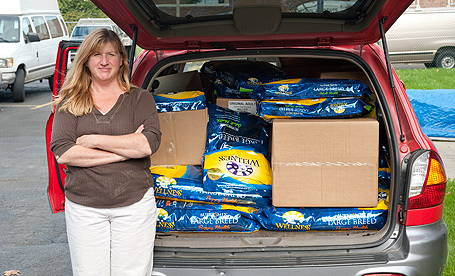 Top: Shannon from DAAWGS, Inc. picks up a van-load of dog food, treats and supplies on October 7, 2009. 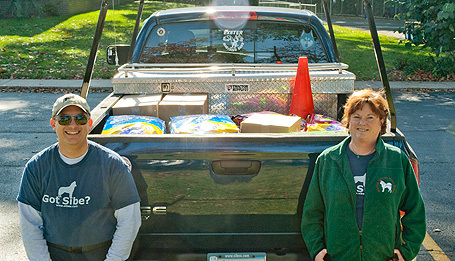 Top: Tammy from Sussex County Animal Association picks up a van-load of dog food, treats and supplies on October 7, 2009. 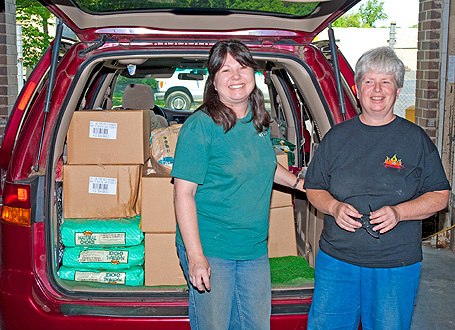 Top: Tammy from Willing Hearts Dalmatian Rescue picks up a truckload of Wellness dog food and assorted treats on October 6, 2009. Top: Ronda from Ronda's Bird and Kitten Rescue picks up a load of birdseed on October 6, 2009. Top: Kathleen from Crested Guardians picks up a load of Wellness Small Breed dog food, Alpo canned dog food and assorted treats and pet supplies on October 6, 2009. Top: Jack from Delaware Valley Doberman Pinscher Assistance, Inc., October 5, 2009. 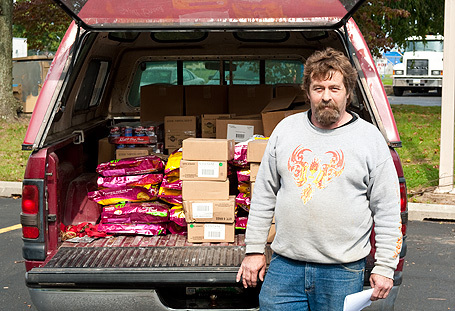 Top: Gary from Spanky's Project picks up a load of Wellness Small Breed dog food, canned food and assorted dog treats on October 2, 2009. 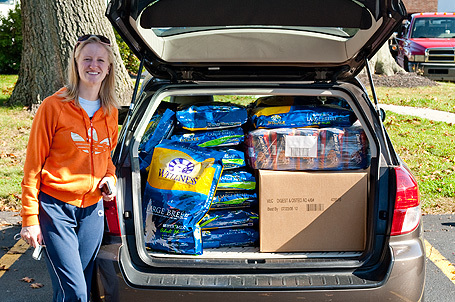 Top: Lisa from Homeward Bound Boxer Rescue picks up a load of Wellness dog food and assorted treats on October 5, 2009. 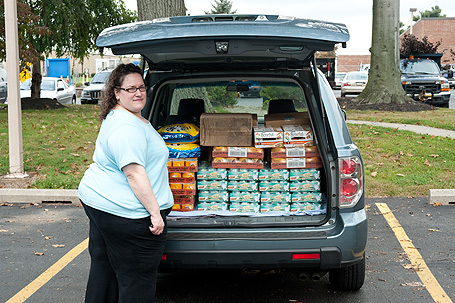 Top: Debbie from CARE of NJ picked up a load of Wellness dog food, canned dog food and assorted treats on October 1, 2009. 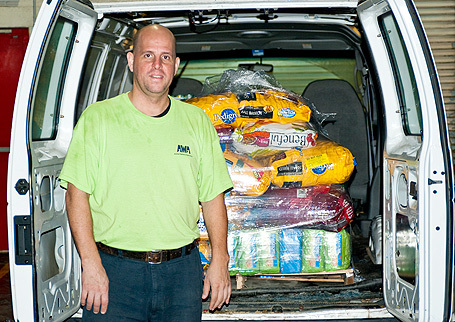 Top: Jeff from Delaware Valley Siberian Husky Rescue picks up a truck-load of Wellness and Royal Canin dog food, Nylabone and assorted treats on September 30, 2009. 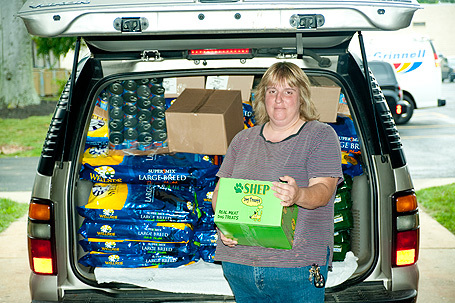 Top: Alane from PA Search & Rescue picks up a load of Wellness dog food, Fortifido Dog Water and treats on September 30, 2009. 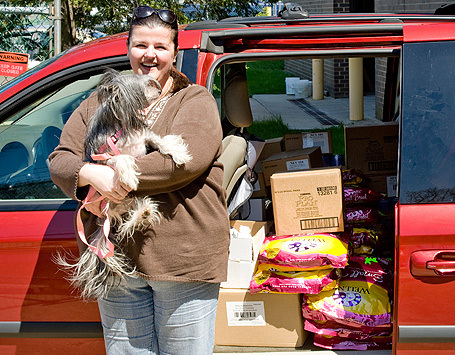 Top: A volunteer from Fuzzy Paws and Helping the Helpless picks up a load of Wellness dog food, treats, canned dog food and other pet supplies on September 29, 2009. 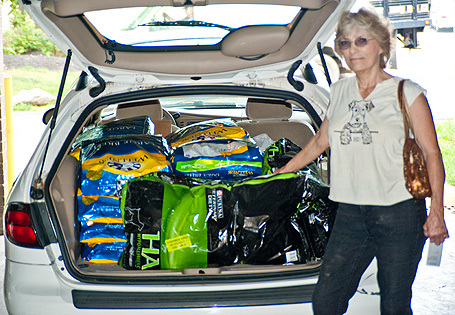 Top: Ronda from Ronda's Kitten & Bird Rescue picks up a load of Wellness dog food and brid seed on September 25, 2009. 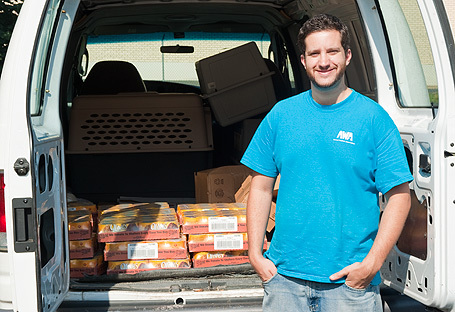 Top: Andrew from Animal Welfare Association picks up 50 cases of 9Lives canned cat food on on September 24, 2009. 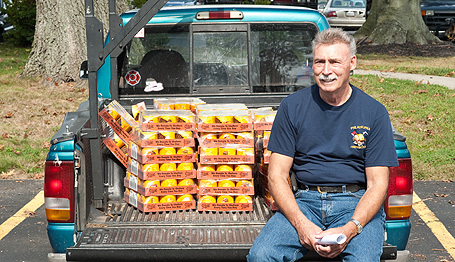 Top: Fred Wollner picks up 50 cases of 9Lives canned cat food on September 23, 2009. 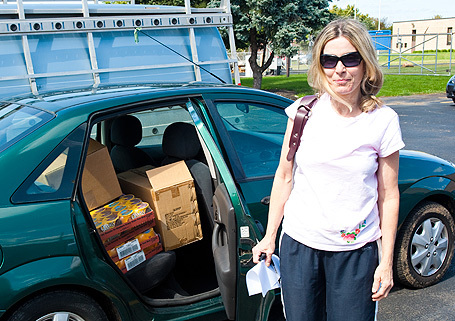 Top: Kelly from It's A Cat's Life picks up cases of canned cat food on September 23, 2009. 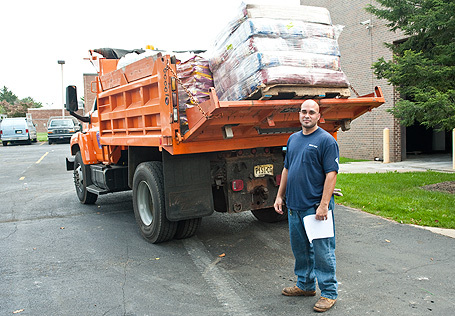 Top: Municipal worker, Jorge, picks up a dump-truck load of canned cat food, dry and canned dog food and treats for Animals Need You on September 23, 2009. 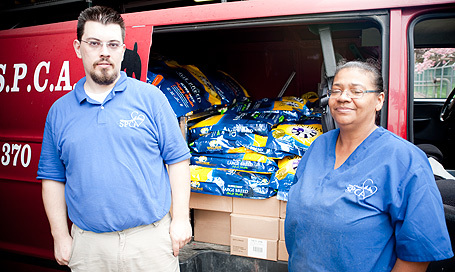 Top: Rosemary from Spay & Save picks up cases of canned cat food on September 21, 2009. 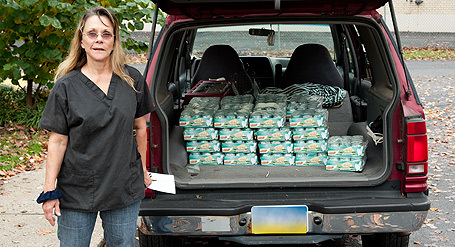 Top: Maria from Summit Animal Rescue Association-South picks up canned cat food on September 21, 2009. 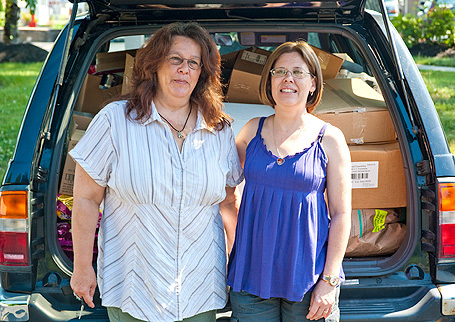 Top: Eileen from Forgotten Cats picked up canned cat food and cat toys on September 17, 2009. 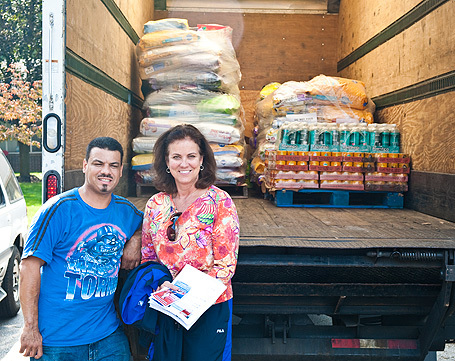 Top: Janet from Liberty Humane Society picks up a trailer-full of assorted dry dog food, canned dog food, treats and medical supplies on September 18, 2009. 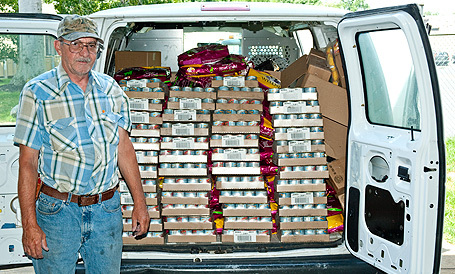 Top: Dennis from Companion Animal Trust picks up cases of cat food on September 16, 2009. Top: Lisa from Alley Cat Enterprises, Inc. picked up Fancy Feast canned cat food on September 14, 2009. 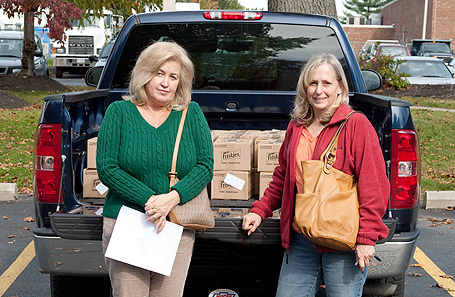 Top: Volunteers from the Animal Welfare Association pick up a van-load of assorted dry dog food, canned cat food, and other treats on September 11, 2009. 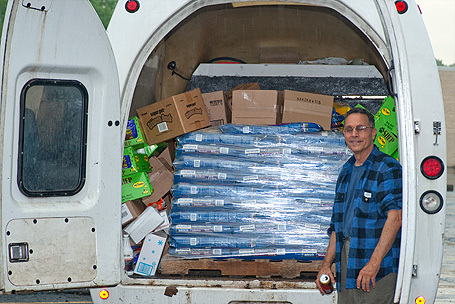 Top: Ed from LaMancha Animal Rescue braved the wet weather to pick up a truck full of dry and canned dog food and treats on September 11, 2009. Top: Iris from West Jersey Volunteers for Animals picked up a Wellness Large Breed and Eagle Pack Mini Adult dry dog food, treats and other pet supplies on September 10, 2009. 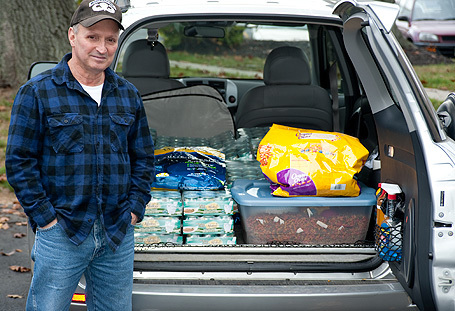 Top: Paul from Loli's Place picked up a an SUV full of Wellness dry dog food, canned dog food, treats and medical supplies on September 9, 2009. 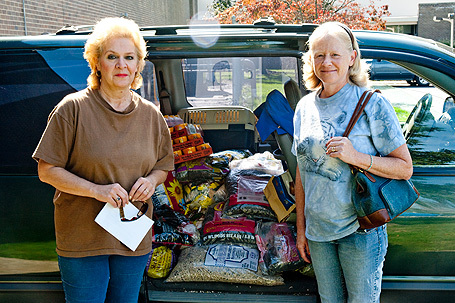 Top: Carol and friend from Rescue Me Yorkie Rescue pick up a van-load of Wellness Small Breed dog food, Treats and other assorted treats on September 8, 2009. 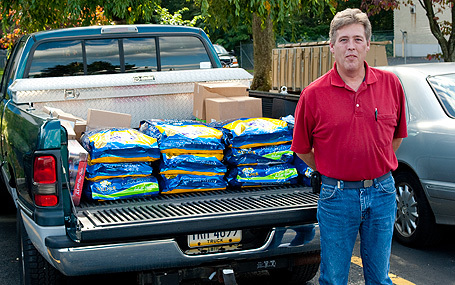 Top: Gary from Hillside SPCA picks up a truckload of Wellness dog food, treats and other pet supplies on August 31, 2009. 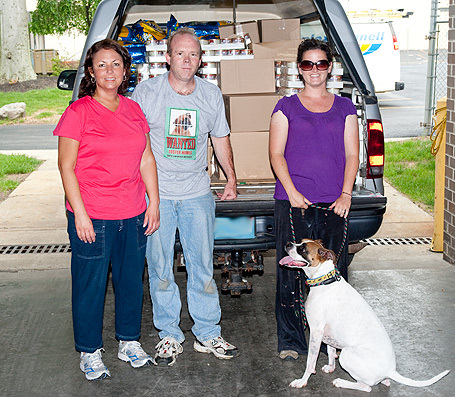 Top: Staff from the Delaware County SPCA pick up a van-load of canned cat food, dog food and treats on August 27, 2009. 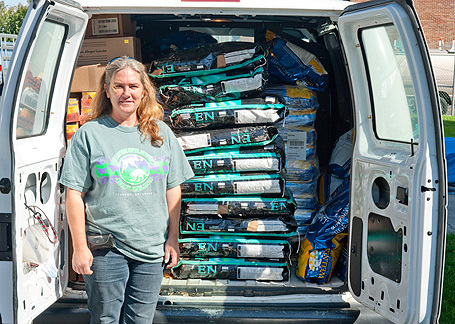 Top: Suzanne from Mid-Atlantic Basset Hound Rescue picks up a load of Wellness dog food, treats and pet supplies on August 26, 2009. 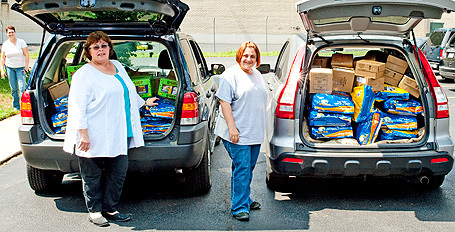 Top: Kathy and husband from New Jersey Aid for Animals picks up Wellness dog and cat food and treats on August 25, 2009. 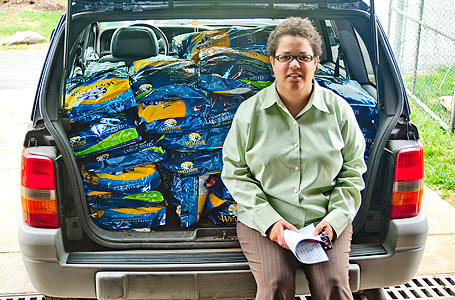 Top: Evie from Daffy's Pet Soup Kitchen picks up Wellness Cat Pouches, dog food and treats on August 24, 2009. 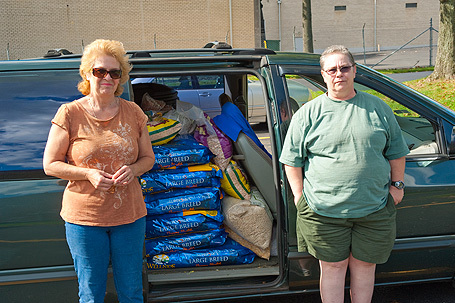 Top: Joyce and friends from Alley Cat Enterprises picks up Wellness dog and cat food and treats on August 24, 2009. 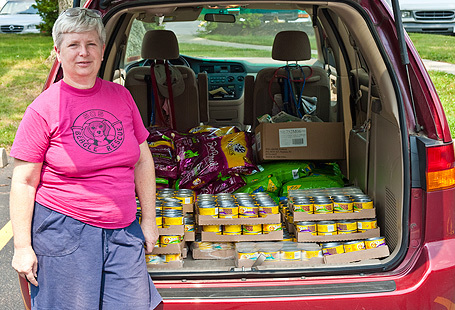 Top: Gail from Forever Home Animal Rescue picks up canned and dry dog food, treats and other pet supplies on August 21, 2009. 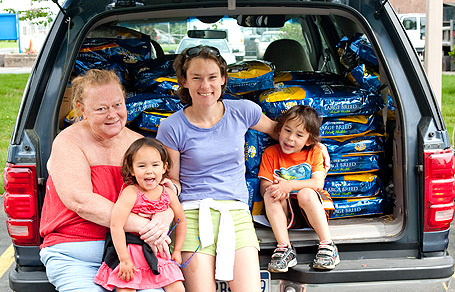 Top: Kim from Wet Nose Rescue picks up two SUV-loads of Wellness dog and cat food and dog treats on August 19, 2009. Top: Kelly from It's a Cat's Life picks up Wellness Cat Pouches on August 19, 2009. Top: Diane and friends from Camden County Animal Shelter pick up Wellness Large Breed Puppy food, cat food and canned dog food on August 18, 2009. 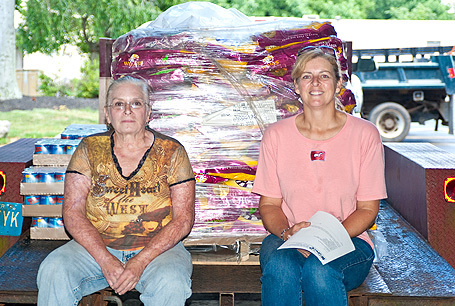 Top: Deb from Diamond Rock Wildlife Rehab picks up Wellness Dog and Cat food to feed her raccoons and foxes on August 14, 2009. Top: Linda from Plain & Fancy Animal Rescue picked up a load of Wellness Large Breed Adult & Puppy food, Wellness Cat Pouches, Nylabone toys and treats, shampoo and other pet supplies on August 12, 2009. 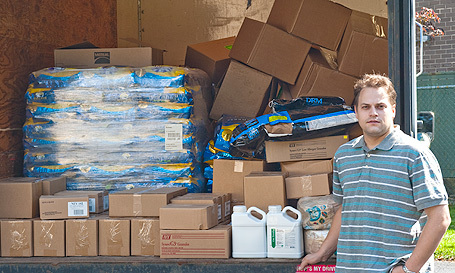 Top: Trailer being loaded with dog food, cat food, pet supplies and other office supplies to be shipped to Metro Animal Services in Louisville, Kentucky after their catastrophic flood on August 11, 2009. 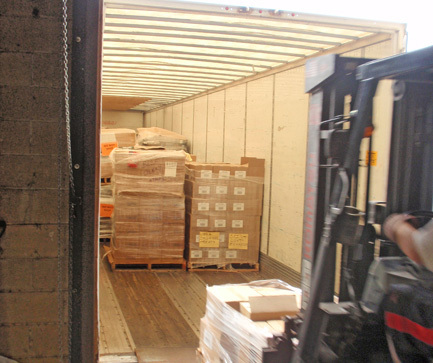 Top: Beverly picks up cases of Iams cat food on August 10, 2009. 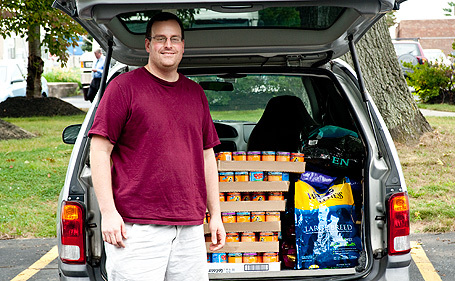 Top: Pat picks up a trunkful of 9Lives canned cat food on August 7, 2009. 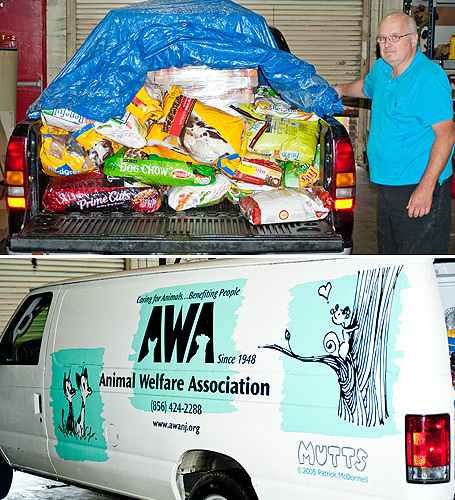 Top: Joe from LaMancha Animal Rescue picked up a load of Wellness Large Breed dog and puppy food, treats and pet supplies on August 6, 2009. 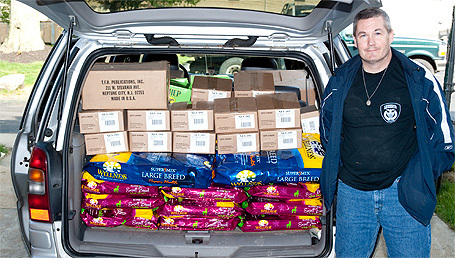 Top: Joey from Airedale Rescue picks up a load of Wellness Large Breed dog food, cat food, treats and supplies on August 5, 2009. Top: Eileen from Forgotten Cats picked up Wellness Cat Food Pouches on August 5, 2009. Top: Linda from Animal Welfare Society and SOS Beagles picked up 9Lives canned cat food and Wellness Small Breed dog food on August 4, 2009. 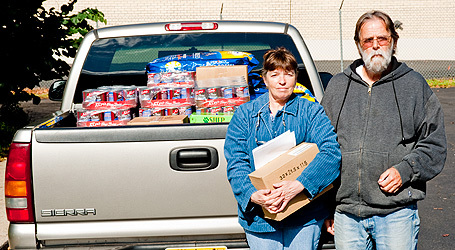 Top: Linda Royce and son from Royce's Rescue picks up cases of cat food and horse supplements on August 3, 2009. 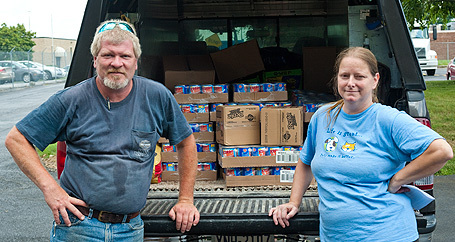 Top: Diane picks up cases of cat food on July 31, 2009. 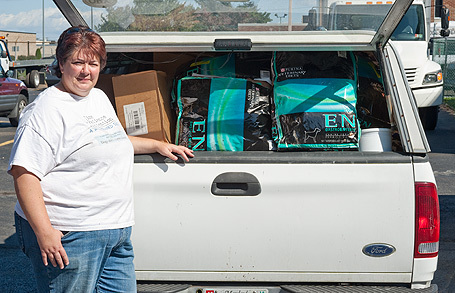 Top: Caroline, a volunteer for Saving the Animals of Rowan in Kentucky picks up a truck-load of canned and dry dog foot and pet care supplies on July 30, 2009. 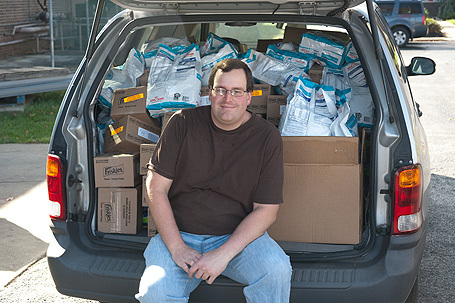 Top: Mike from New Jersey Animal Rights Alliance picks up cases of Wellness cat food on July 30, 2009. 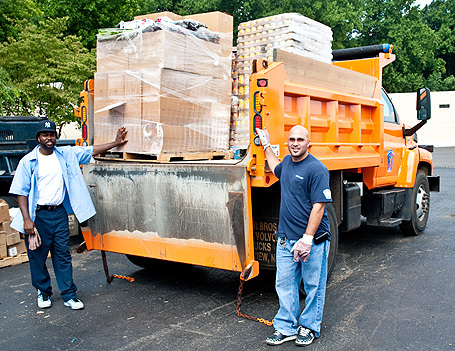 Top: Municipal workers pick up a dump-truck-load of cat food, dog food, treats and supplies for Animals Need You on July 30, 2009. Top: Mike Devine picks up cat food on July, 29, 2009. 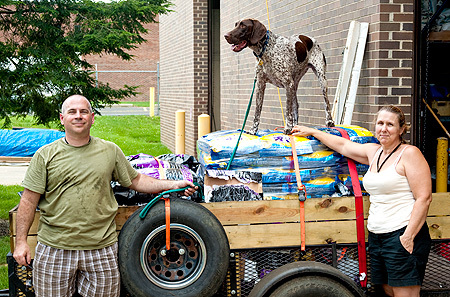 Top: The Croasdale's and foster dog, Milo, from Mid-Atlantic German Shorthair Pointer Rescue pick up a trailer-load of dog food, treats and supplies on July 28, 2009. 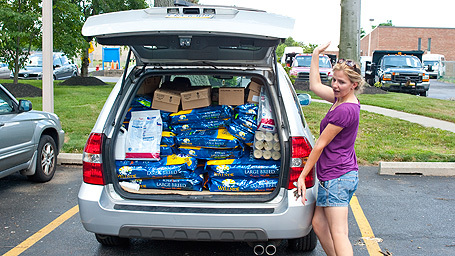 Top: Ann from East Coast Greyhound Aid picks up a load of dog food, treats and supplies on July 27, 2009. 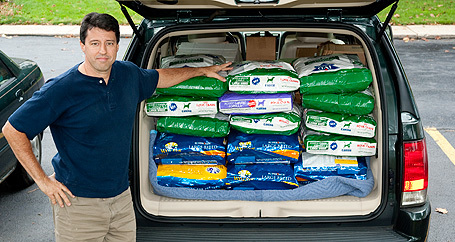 Top: Rob from Willing Hearts Dalmatian Rescue picks up a load of dog food and treats on July 27, 2009. 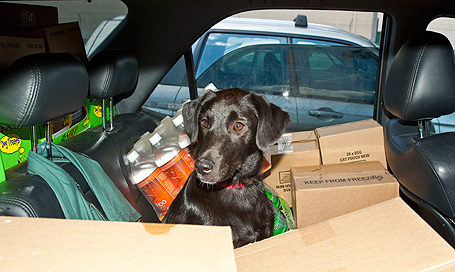 Top: Alane from Search & Rescue of Pennsylvania picks up a load of dog food and treats on July 27, 2009. 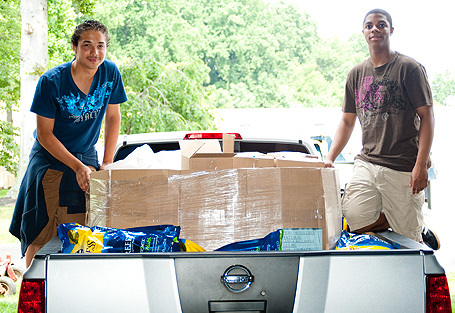 Top: Students from Brimm's Chow Hound House pick up a load of dog food on July 27, 2009. 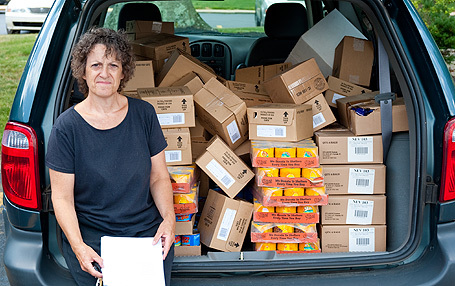 Top: A volunteer from the Animal Welfare Association picks up cases of cat food and Purina EN on July 9, 2009. 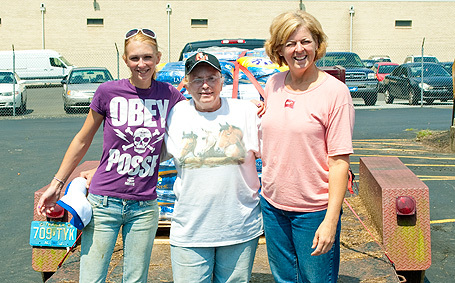 Top: Courtney from Cats Bridge to Rescue picks up a car-load of cat food, dog food and pet supplies on July 17, 2009. 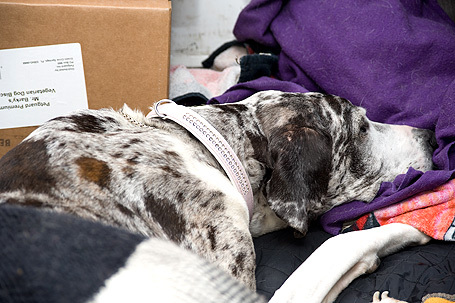 Top: Larry and Angel the Great Dane from All About Them Giant Breed Rescue picks up a van-load of Wellness dog food, treats and medical supplies on July 14, 2009. 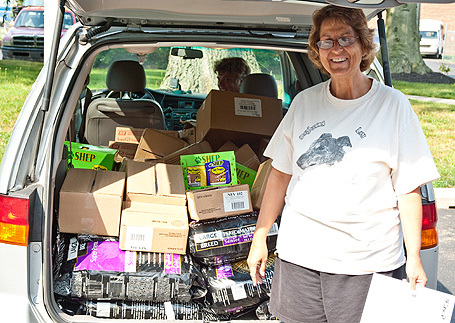 Top: Robin from Wolf Spirit Toy Breed Rescue in Ohio picks up an SUV-load of food on July 14, 2009. 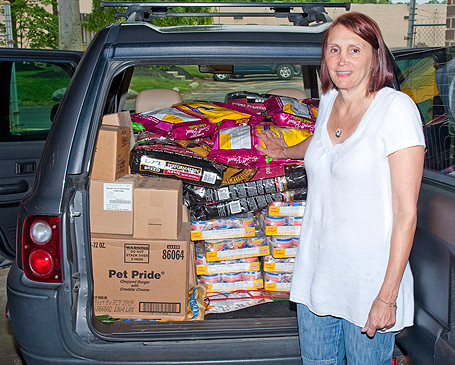 Top: Carol from Heaven Sent Pet Rescue picks up an SUV-load of cat food on July 9, 2009. 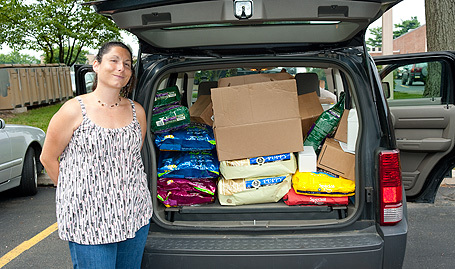 Top: Valerie from Animal Lifeline picks up an SUVload of Wellness dog and cat food, assorted treats and pet supplies on July 8, 2009. Top: Dixie, available for adoption through Animal Lifeline, wonders how she'll ever find her way out of the car now! 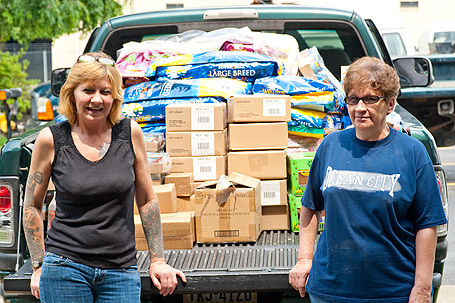 Top: Brenda and Diane from Camden County Animal Shelter picked up a trailer and truckload of Performatrin and Wellness dog food, treats, canned cat food, Nylabone products and pet supplies on July 8, 2009. 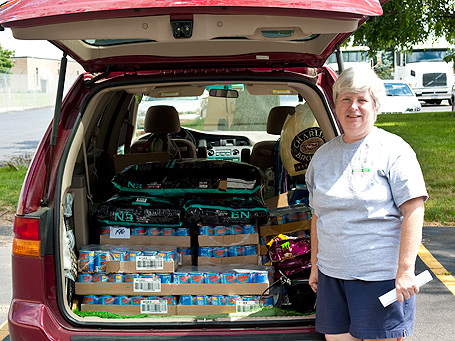 Top: Marilyn from Hope for the Animals picks up a truckload or Wellness cat food pouches, Wellness dog food and other assorted pet care products on July 7, 2009. 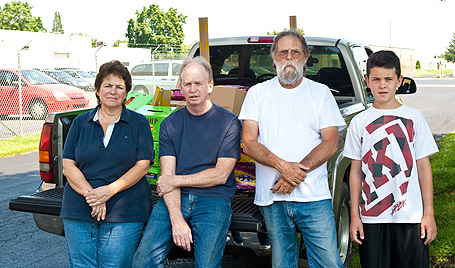 Top: Jodi and volunteers and from American Bulldog Rescue pick up three SUVloads of food on July 6, 2009. 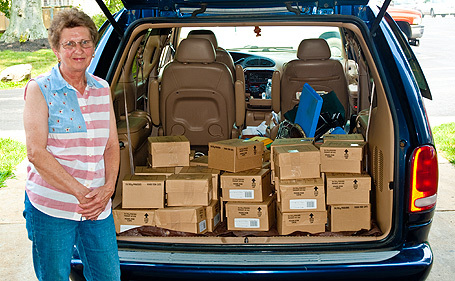 Top: Rosemary from Spay & Save, Inc picks up a carload of Purina ProPlan cat food on July 6, 2009. 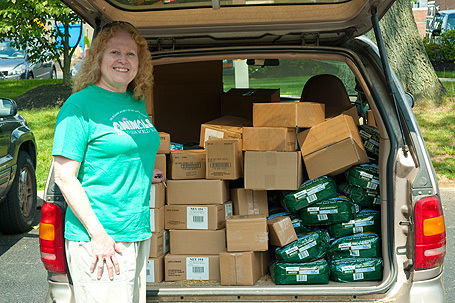 Top: Shannon from DAAWGS, Inc. picks up a truckload of Wellness dog food, Shep treats, Nylabone edibles and assorted pet supplies on July 2, 2009. 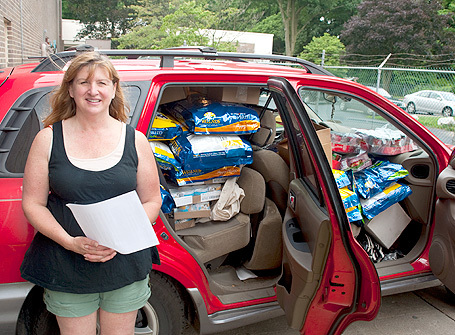 Top: Kim from Misfit Toy Rescue picks up a load of Wellness dog food and assorted treats and pet products on July 1, 2009. 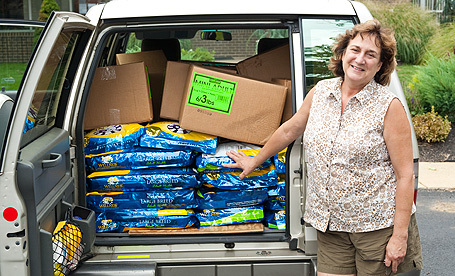 Top: A volunteer from Sussex County Animal Association picks up a van-load of Wellness Small Breed dog food, canned cat food and other pet and medical supplies on June 30, 2009. 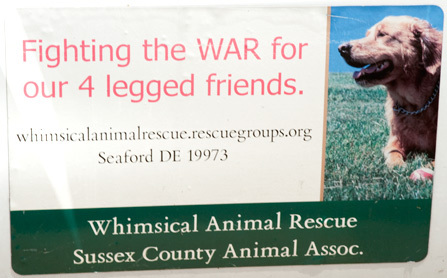 Top: Sussex County Animal Association banner. 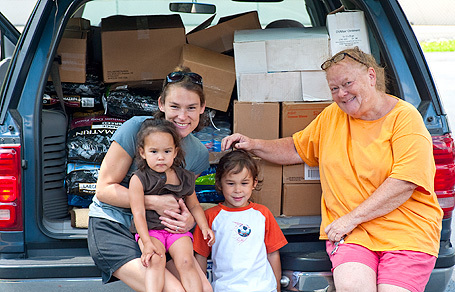 Top: Veronica from Helping the Helpless picks up a truckload of Wellness dog food, treats, and pet supplies on June 29, 2009. 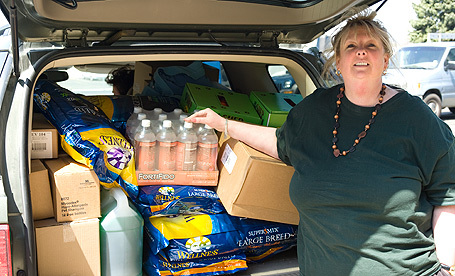 Top: Kim from Animal Friends Furever picks up a load of food, treats and medical supplies on June 29, 2009. 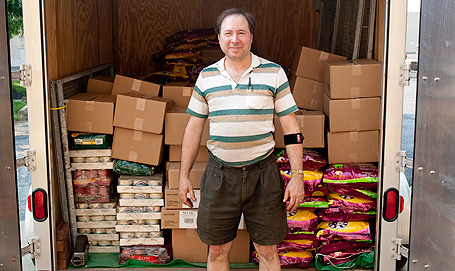 Top: Richard from Greyhound Ranch Adoptions in Florida picks up a truck-load of Wellness dog food, canned dog food, treats and pet supplies on June 30, 2009. 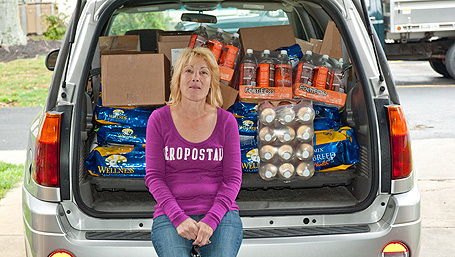 Top: Starr from All 4 The Dogs rescue picks up a truckload of dog and cat food on June 26, 2009. 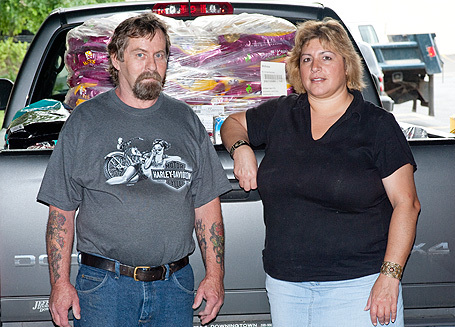 Top: John and Daisy from Mighty Mutts pick up a truckload of 9 Lives cat food and Purina Veterinary Diet dog food on June 24, 2009. 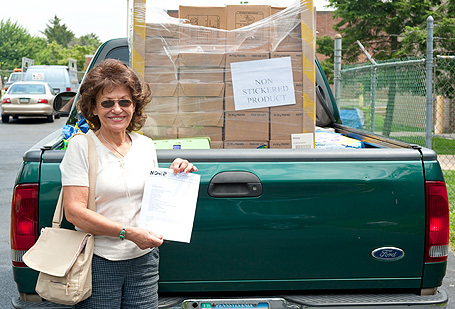 Top: Monica from Spanky's Project picks up a pick-up truck load of Wellness and Performatrin dog food on June 24, 2009. 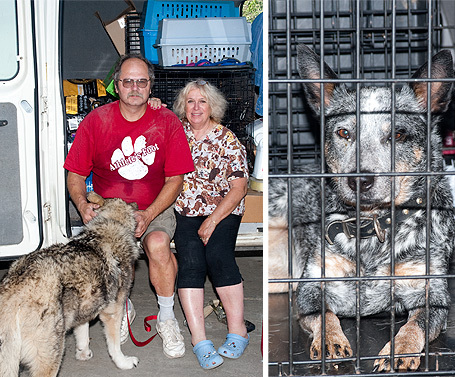 Top: Peg Moore and her husband pick up a van-load of food and treats for Mid-West Rottweiler Rescue during a dog haul on June 24, 2009. Top: Geezer, making himself right at home! 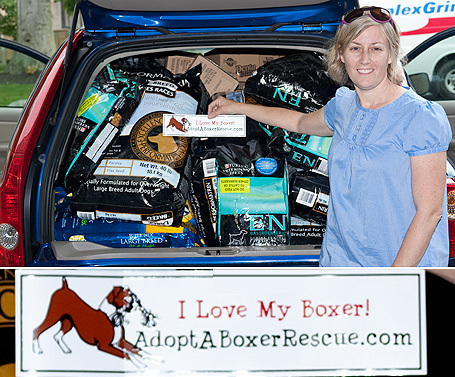 Top: Dawn from Adopt-A-Boxer Rescue picks up an SUV-load of assorted Wellness, Performatrin and Purina food and treats on June 23, 2009. 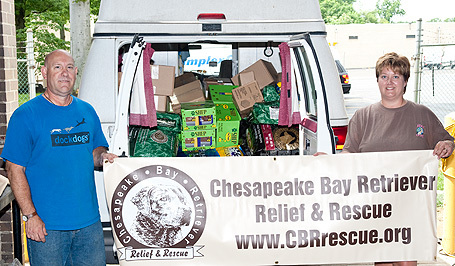 Top: Craig and Heather from Chesapeake Bay Retriever Relief and Rescue pick up a truck-load of food, treats and medical supplies on June 19, 2009. 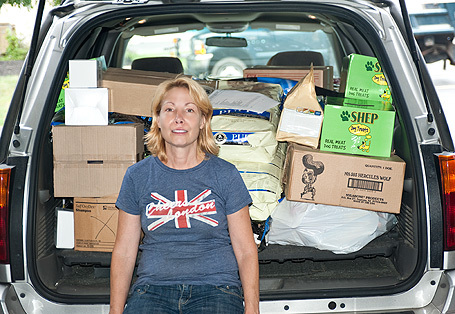 Top: Caroline from Almost Home Dog Rescue picks up a car-load of Wellness dog food, assorted treats and medical supplies on June 19, 2009. 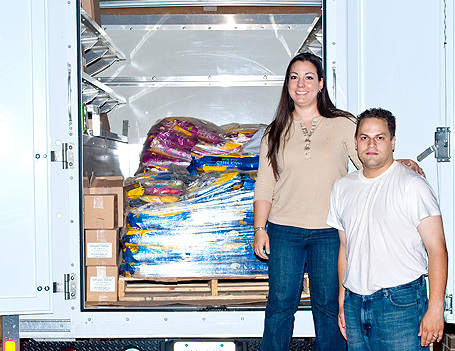 Top: Christine and Troy from Fuzzy Paws Rescue pick up a truckload of Wellness Small and Large Breed dog food, Nylabone edibles and other assorted treats on June 18, 2009. 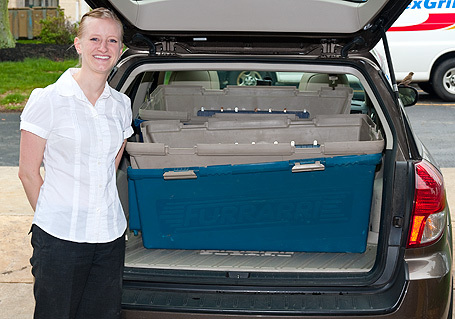 Top: Lisa from Homeward Bound Boxer Rescue picks up two used crates on June 16, 2009. 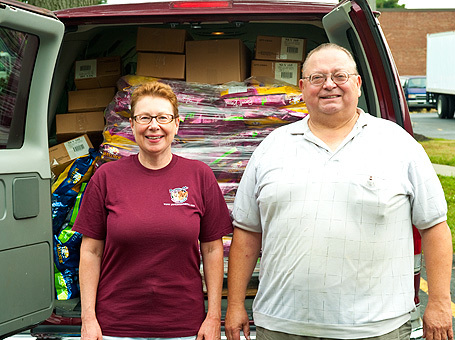 Top: Alane from Search & Rescue of Pennsylvania picks up van-load of canned dog food, treats and Nylabone toys and treats on June 15, 2009. Top: Trailer being loaded with food and supplies for Fast Friends in New Hampshire on June 12, 2009. 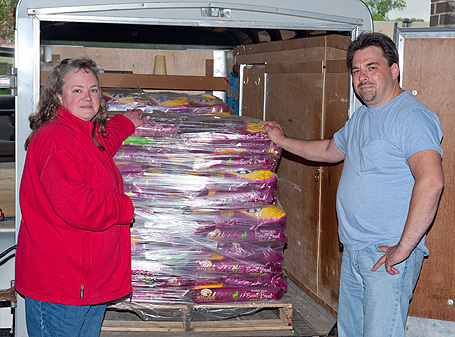 Top: Dave from Willing Hearts Dalmatian Rescue picks up a pallet of Wellness dog food on June 12, 2009. 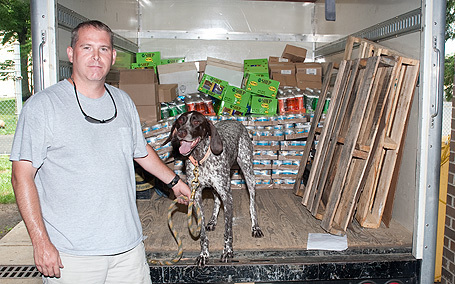 Top: A volunteer from Mid-Atlantic German Shorthair Pointer Rescue and his dog picks up a truck-load of Wellness Dog Food, Vida Organic Treats and other treats, canned dog food and other pet supplies on June 12, 2009. 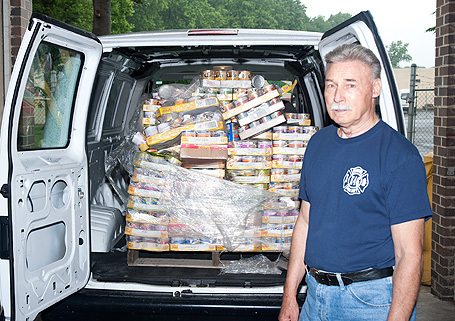 Top: Fred picks up a truck-load of canned cat food on June 12, 2009. 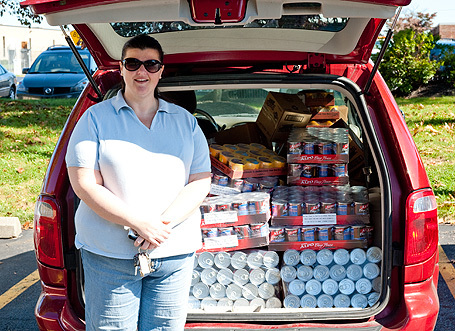 Top: Vicki from PCCC picks up a van-load of canned cat food on June 11, 2009. Top: Kathleen from Crested Guardians and foster dog pick up a van-load of Performatrin dog food, treats and supplies on June 9, 2009. Top: June from Mid-Atlantic Basset Hound Rescue picks up a truck-load of food and supplies on June 9, 2009. 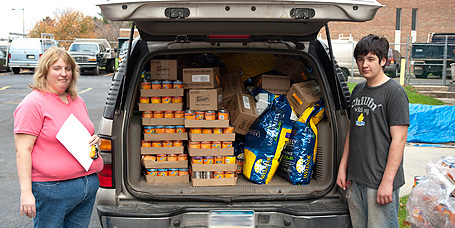 Top: A volunteer picks up a car-load of cat food on June 9, 2009. 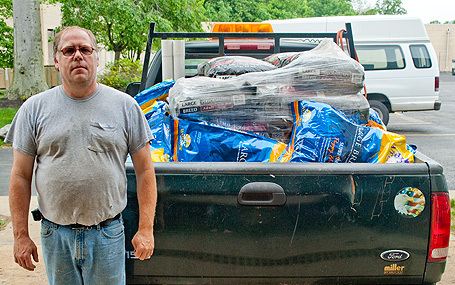 Top: John from Mighty Mutts picks up three pallets of dog and cat food and miscellaneous treats on June 8, 2009. Top: Colleen from Adopt-A-Boxer Rescue picks up a load of supplies on June 8, 2009. 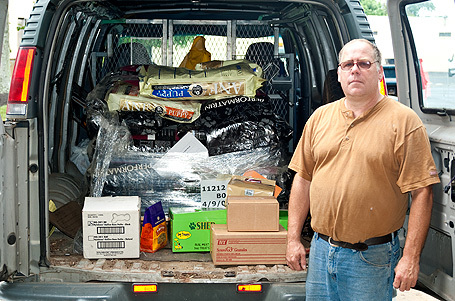 Top: Steve from Schuylkill Center Wildlife Rehab picks up a van-load of Alpo canned dog food, Performatrin dog food and Wellness dog food on June 5, 2009. Top: Kim from Wet Nose Rescue transports a van full of Wellness Puppy Food, Nylabone treats and toys, medical supplies and treats to Paws to the Rescue on June 5, 2009. 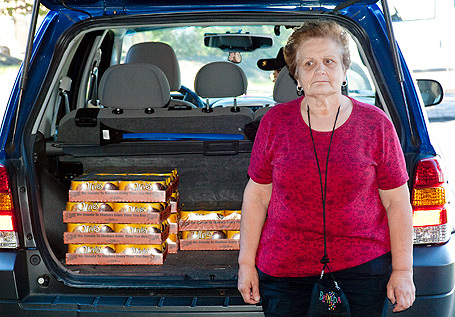 Top: Eleanor from Bingo's Foundation picked up cases of Friskies cat food on June 5, 2009. 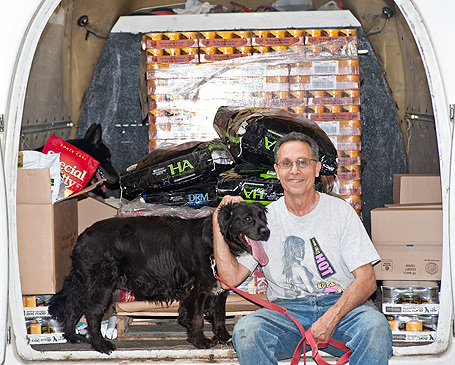 Top: Joe from LaMancha Animal Rescue picks up a load of Wellness dog food, Nylabone treats and supplies on June 4, 2009. 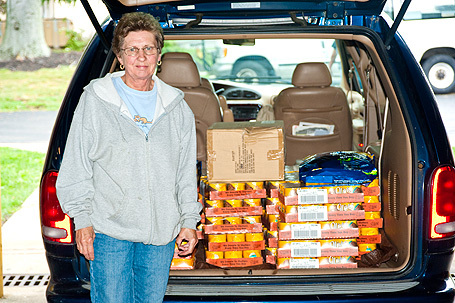 Top: Susan from Susan's Cats & Kittens picks up cases of Friskies canned cat food on June 3, 2009. 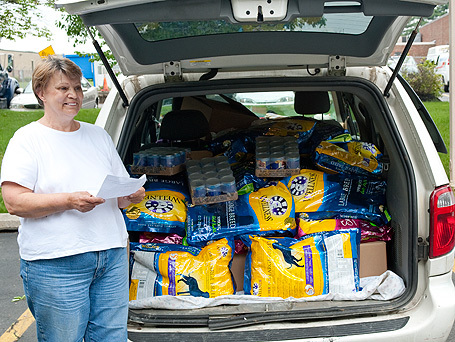 Top: Evie from Daffy's Pet Soup Kitchen picks up a load of Friskies cat food and Performatrin dog food on June 3, 2009. 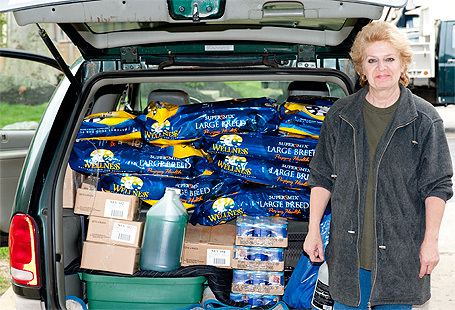 Top: Linda from SOS Beagle Rescue picks up a load of dog food and supplies on June 2, 2009. 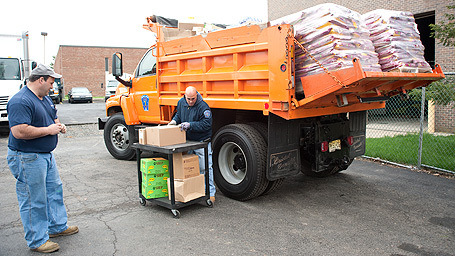 Top: Township workers pick up 6 pallets of cat and dog food for Animals Need You on June 1, 2009. 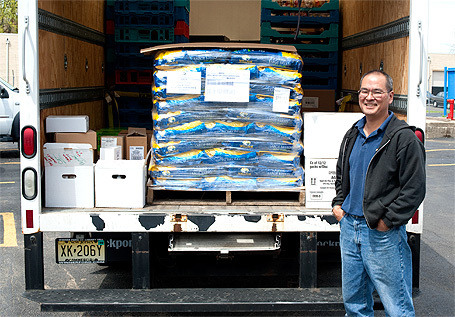 Top: Mitch from Camden County Animal Shelter picks up a truckload of food and treats on May 29, 2009. Top: Pat picks up canned cat food on May 29, 2009. 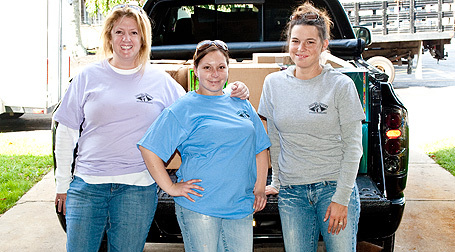 Top: Margaret and other volunteers from Philly PAWS pick up 2 1/2 car-loads of food and supplies on May 28, 2009. 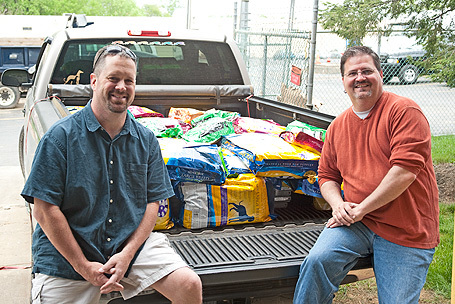 Top: Dave from Willing Hearts Dalmatian Rescue picks up a truckload of dog food and supplies on May 28, 2009. 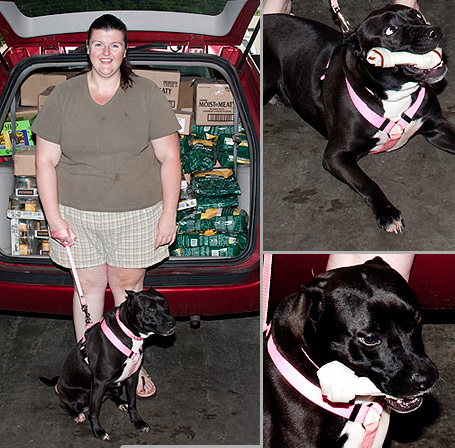 Top: Jodi from American Bulldog Rescue picks up a load of Wellness Dog Food, Nylabone toys and treats and various other supplies on May 26, 2009. 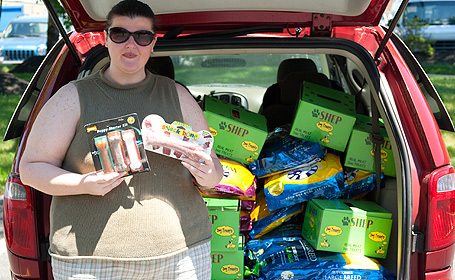 Top: Kim from Wet Nose Rescue picks up a load of Nylabone treats and toys and pet supplies on May 22, 2009. Top: Gail from Forever Home Animal Rescue picked up a load of Wellness and Performatrin dog food, canned puppy food, Nylabone bones andtreats and other assorted treats and supplies on May 22, 2009. Top: Kathleen from Crested Guardians picks up a van full of Wellness Small Breed Dog Food, treats, canned puppy food, medical and pet care supplies on May 21, 2009. 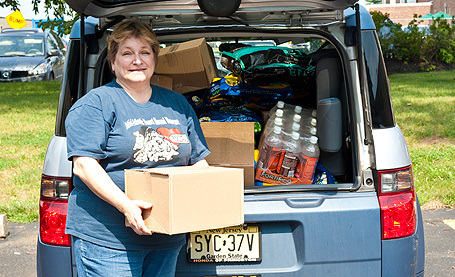 Top: Barbara from Burlington County Animal Alliance picks up a load of Wellness Dog Food, Nylabone Treats and other pet supplies and medicines on May 15, 2009. 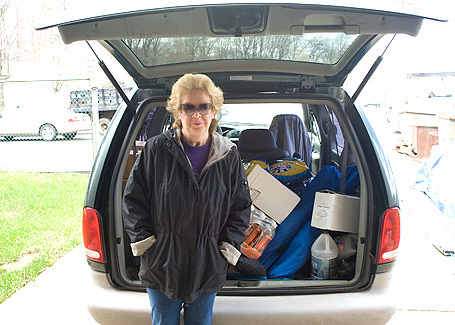 Top: Veronica from Helping the Helpless in Coatsville picks up a load of Wellness Dog Food, Nylabone Toys and Treats and other pet supplies and medicines on May 13, 2009. 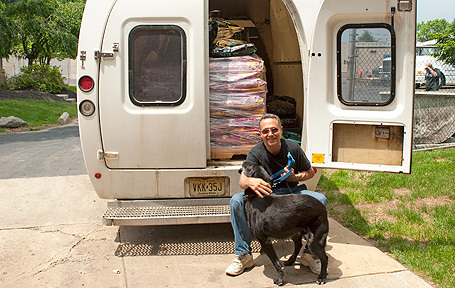 Top: Matt from West Jersey Volunteers for Animals picks up Wellness dog food, Nylabone treats and shampoo on May 12, 2009. 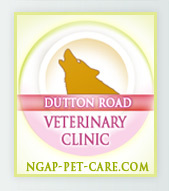 Top: Ronda from Ronda's Bird Rescue picks up Wellness dog food, Nylabone treats and shampoo on May 11, 2009. Top: Alane from Search & Rescue of Pennsylvania picks up Wellness dog food, Nylabone organic treats and other assorted treats on May 11, 2009. 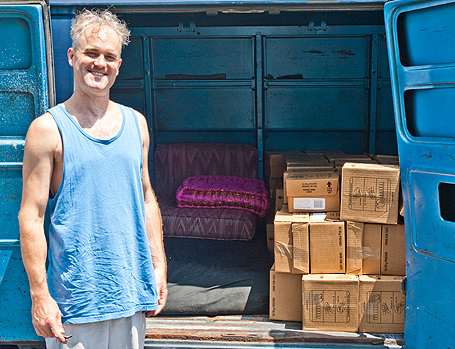 Top: John from Mighty Mutts picks up a van-load of Wellness Large Breed, Small Breed and Performatrin dog food, Nylabone treats as well as other assorted treats, pet and medical supplies on May 7, 2009. Top: Beth from Crest Care picked up a trailer load of Wellness Small Breed dog food, Nylabone bones and organic treats and other assorted products on May 5, 2009. 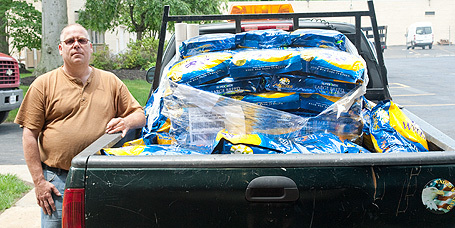 Top: A volunteer from Philly Paws picked up a load of dog-food and treats on May 5, 2009. 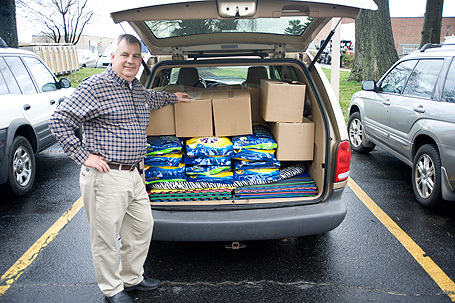 Top: Employees from the Delaware County SPCA picked up a van-load of Wellness dog food, treats, shampoo, and medical supplies on May 1, 2009. Top: Julie from Tri-State Weimaraner Rescue picks up a load of Wellness dog food, Nylabone treats and Fortifido dog water on April 30, 2009. 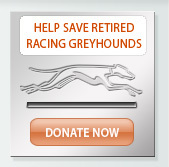 Top: Greyt Adventures Greyhound Rescue picks up a load of Wellness dog food on April 30, 2009. Top: Gretchen from Main Line Animal Rescue picks up Nylabone and Shep treats and supplies on April 29, 2009. 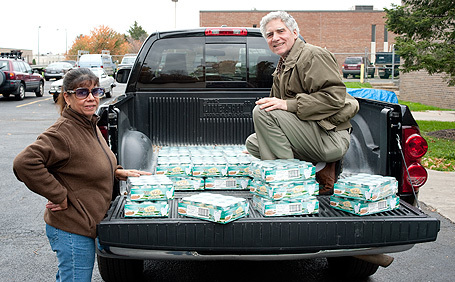 Top: A volunteer picks up two pallets of Wellness Adult Dog Food and miscellaneous other supplies for Camden County Animal Shelter on April 23, 2009. 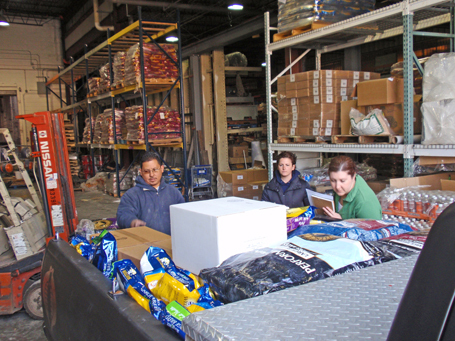 Top: Township workers picked up 6 pallets of Wellness Small Breed Dog Food, treats, canned food, medical and pet supplies for Animals Need You on April 22, 2009. 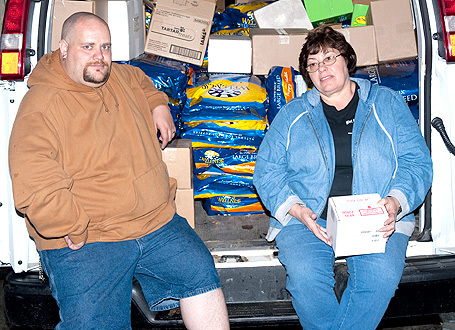 Top: Linda Gress and her husband pick up a another load of dog food for All About Them Giant Breed Rescue on April 21, 2009. Top: Kathleen and foster dog, Prada, from Crested Guardians picks up a van full of Wellness Small Breed Dog Food, treats, canned puppy food, medical and pet care supplies on April 16, 2009. 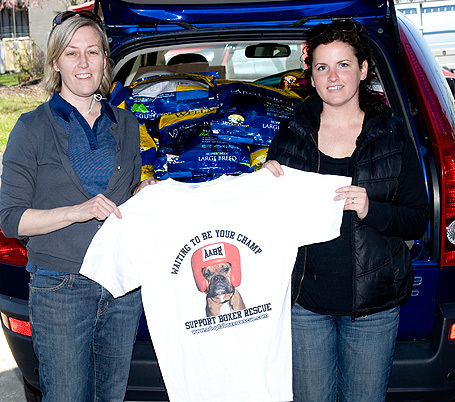 Top: Dawn and Colleen from Adopt-A-Boxer Rescue return for another truck-load of Wellness Dog Food and treats on April 16, 2009. 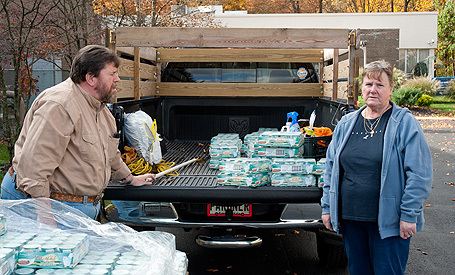 Top: Susan from Mid-Atlantic Basset Hound Rescue picks up a load of Wellness Dog Food, medical and pet care supplies on April 9, 2009. Top: Starr from All 4 The Dogs picks up a truck-load of Wellness Dog Food, cat food, medical and pet care supplies on April 9, 2009. 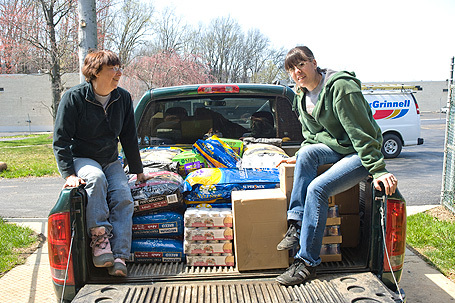 Top: Jayme from Northeast Animal Rescue picks up a load of cat food and cat toys on April 8, 2009. 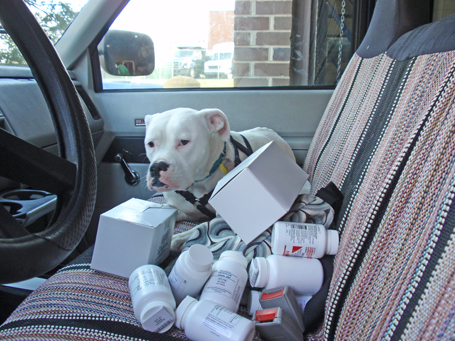 Top: Are all these meds for me?! 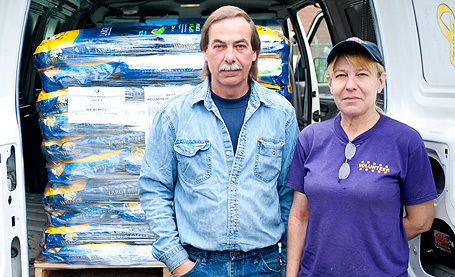 Top: Colleen from Adopt-A-Boxer Rescue picks up a truck-load of Wellness Dog Food, medical and pet care supplies on April 8, 2009. 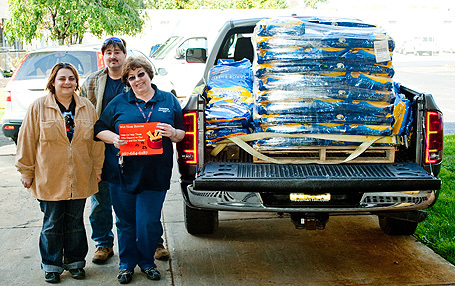 Top: Ronda from Ronda's Bird Rescue picks up Wellness Dog Food, cat food, medical and pet care supplies on April 7, 2009. 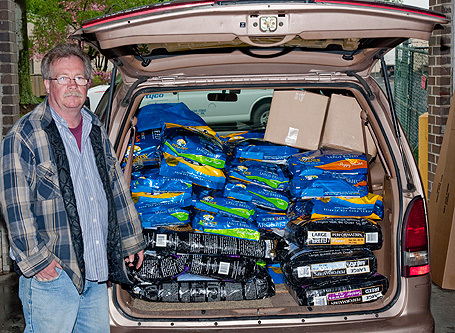 Top: Tony picks up a load of Wellness Dog Food, medical and pet care supplies for Linda Ann's Greyhound Rescue in Whitehall, PA on April 3, 2009. Top: Angel, the Great Dane. 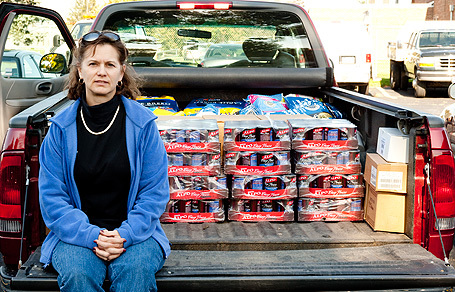 Top: Donna Cragin picking up a load of supplies for Last Chance Ranch, Inc.